Come for a special half hour vigil mass this reading/study day to celebrate this holy day of obligation. A special blessing will be offered over all student's brains and all are welcome. Begins at 8 pm. Please take a study break and join us Wednesday night at 7m in upstairs Ridgway for I-House Holiday Night! We will have a few different presenters talking about some different holidays from all over the world. We hope you can make it! The Department of Law, Politics, and Society will be inaugurating the Arthur B. Aarstad Scholar Award for the Outstanding Senior in Political Science on Friday, December 8, at 2 p.m. in Dunigan Lounge. The award’s namesake, Arthur Aaarstad, will be in attendance for the occasion. Aarstad joined the faculty of Evansville College in 1958 as a member of the Department of History and Political Science, and he worked here until he retired in 1995. In addition to his teaching and administrative duties, Arthur served on the EVSC school board and was elected to the Vanderburgh County Council. He won the Outstanding Teacher of the Year award in 1971. A reception will be held to launch this new award, and there will be a brief program. Arthur Aarstad will offer some observations on his long career at UE, and some of his former colleagues and students will say a few words in praise of his service to our campus community. There will be light refreshments offered, and the first-ever Aarstad Scholar award recipient will be announced. All members of the UE campus community are welcome to join us in honoring this former colleague and this outstanding student. Wednesday December 6th from 12pm to 2pm in Ridgway, the women of Phi Mu will be passing out suckers to help brighten your day and wish everyone good luck on all of your finals! It is back to the road for the University of Evansville men’s basketball team as it heads north to take on Bowling Green today at 6:00 p.m. CT.
Evansville is coming off of a 98-56 win over Oakland City on Saturday as four players finished in double figures. KJ Riely backed that up a 13-point game at New Mexico with a solid contest against the Mighty Oaks, posting nine points while setting his mark with nine assists. He registered 10 assists against just one turnover for the week while averaging 11 points per game. Riley leads the team with 24 free throw makes and 32 attempts. Junior Marty Hill made his debut at New Mexico and started off what was a great pair of debut games. Hill entered the contest in Albuquerque and scored on his first possession; he completed his first game with four points and seven rebounds. His shooting prowess was on display in Saturday’s game against Oakland City as he notched 12 points while hitting four out of five triples. John Hall has been working hard at finding his niche on the UE squad and his work paid off against Oakland City. Hall set career marks with 9 points, 7 rebounds and 3 assists. He connected on four of his five attempts in the contest. Another Aces player that had his best outing in the win over OCU was freshman Evan Kuhlman. The Ohio product registered nine points, eight rebounds and 24 minutes, all his career bests. Bowling Green enters today’s match-up with a 7-2 record after defeating Norfolk State by a final of 92-77 on Saturday. The Falcons are led by Dylan Frye and Justin Turner, who average 16.8 and 16.5 points per game, respectively. Alex Long was the leader against NSU, posting 22 points on 10-13 shooting. BGSU ranks in the top ten in the nation in free throw attempts and makes. The two teams met last season at the Ford Center with Evansville hanging on for a 69-66 victory. Jaylon Brown was the difference in that contest, scoring a game-high 29 points while hitting 14 out of 15 free throw tries. On Wednesday, December 6 from 4:00-6:00 p.m., Inter-Greek Council will be hosting a Pet Day with the Vanderburgh Humane Society in the small gym of Carson Center. This will be a time in which the campus community (students and faculty) can come play with pets that Humane Society brings. Gently used or new towels or linens. Please avoid buying dog food! The Humane Society only feeds one brand to keep diets consistent. Come out, take a break from classes and studying, and have fun with the pets! Hope to see you there! Join us for our annual Holiday Pops Concert. UE's Choirs, Wind Ensemble, Symphony Orchestra, and University Band are among the ensembles audiences can expect to enjoy. This year's featured guest is Evansville's own Gina Moore. Moore will sing a number of holiday favorites, including Sweet Little Jesus Boy, Have Yourself a Merry Little Christmas, and The Christmas Song. Other selections include variations on Joy to the World, Amazing Grace, Leroy Anderson's classic Sleigh Ride, and of course, the traditional sing-a-long! The Department is pleased to partner with the Tri-State Food Bank and Christian Charities Food Bank. Tickets are free, but attendees are encouraged to bring a donation of canned food which the food banks will share with those in need. For the first time, this year's concert will be presented both in Evansville at the Victory Theatre downtown, and in Henderson, Kentucky, as part of a budding partnership with the Preston Arts Center. The concert at the Victory is made possible through the generosity of the Mesker Music Trust by Fifth Third Bank, trustee. UE's music programs are also pleased to have the support of the Friends of UE Music. The program will be presented at the Victory Theatre on Tuesday, December 5 at 7:30 p.m., and at the Preston Arts Center on Wednesday, December 6 at 7:30 p.m. Both concerts are free and open to the public. For complete program information on the concert at the Victory in Evansville, go here. For complete program information on the concert at the Preston Arts Center in Henderson, go here. Free off-site paper shredding by Piranha Mobile Shredding will return to campus once again on Thursday, December 7 (Reading/Study Day) from 10:00 a.m.-1:00 p.m. All UE students, faculty, staff, and alumni can take advantage of this free service by bringing paper to the Piranha truck in Koch Center for Engineering and Science parking lot. Paper will be shredded off-site. So, if mounds of paper are taking over your office, home, or room, this is the time to gather those old files, receipts, cancelled checks, tax forms, etc. No need to take out the staples or paper clips. Avoid identity theft by having confidential information permanently destroyed. Please - no telephone books, magazines, or newspapers. Also, please note that there is a 100 pound paper limit per visit (number of visits is not limited). Register for the student leadership conference! Want to expand upon your leadership skills and knowledge base but don't know how? I have great news for you! On January 20, the University of Evansville Leadership Academy and Center for Student Engagement are putting on their annual Student Leadership Conference. This year, the conference's theme is "Bright Lights, Brighter Leaders." This is an all-day conference where you will get the opportunity to talk with other student leaders and hear amazing speakers discuss their own leadership journeys. There is a $10 registration fee, but with that you will get a T-shirt, lunch, and an unforgettable experience! To register for the event, go here. Early registration for the conference (to ensure your free T-shirt) closes on Reading/Study Day, Thursday, December 7. Register today! UE Clay Club is holding a Holiday Sale in Ridgway University Center on December 6 and 7 from 10:00 a.m.-5:00 p.m. Club members will be selling ceramics bowls, cups, serving trays, business card holders, cell phone holders, T-shirts, slumped glass trays, and recycled glass décor. These one-of-a-kind, hand-crafted items make great gifts. Come see for yourself before you leave for break. An open house reception for Jeannette Oakley will be held on December 5 from 1:00-3:00 p.m. in the Tapley Center located in Room 243 in Graves Hall. Jeannette is leaving the University after 16 1/2 years of dedicated service. Please make time to stop by and say goodbye to Jeannette. The Pancake Study Break is back for the fall semester! Take this opportunity to relax a bit before finals start. Join us for pancakes and fun on Thursday, December 7 from 9:00-11:00 p.m. in the dining hall in Ridgway University Center. Door prizes will be awarded. The event is free of charge for UE students. A UE ID will be required. Support the PTA department by going to Chipotle between 4:00-8:00 p.m. on December 6 and presenting this flyer (either by printing it out or showing in on your smartphone) or just tell the cashier you’re supporting the cause. If you do, 50 percent of the proceeds will be donated to UE Physical Therapist Assistant Program. Finals got you stressed? Counseling Services - with help from RSA and SAB - is hosting a relaxation event on Thursday, December 7 (Reading/Study Day). The event will be from 11:00 a.m.–2:00 p.m. in Eykamp Hall, Rooms 253-255, Ridgway University Center. Come and leave at your convenience and move at your own pace. Mohammad K. Azarian, professor of mathematics, will be the speaker for 2017-18 Andiron Lecture in Liberal Arts and Sciences on Wednesday, December 6. Andiron lectures are free and open to the public and begin at 4:00 p.m. in Eykamp Hall, Room 252, Ridgway University Center. Azarian’s lecture will examine the influence of the work of Ghiy¯ath al-D n Jamsh d Mas’¯ud K¯ash¯ - one of the most renowned mathematicians and astronomers in Iranian history and one of the most fascinating medieval Muslim mathematicians in the world. He is called “Persia’s Second Ptolemy.” Azarian will talk about K¯ash¯an ’s famous treatises and books, including Encyclopedia of Arithmetic, The Treatise on the Circumference, The Treatise on the Chord and Sine, and Stairways to Heaven. Azarian earned his Bachelor of Science from Tabriz University in Iran, his Master of Science from Southern Illinois University, and his PhD from Saint Louis University. Azarian was a 2007-08 Global Scholar at the University of Evansville. He was the recipient of the 2017 Mathematical Association of America-Indiana Distinguished Service Award. He is a Discipline Peer Reviewer for the Fulbright Scholar Program, and is a reviewer for the American Mathematical Society’s Mathematical Reviews. He served on the Executive Board of the Indiana Section of Mathematical Association of America (2001-07), where he was responsible for the Indiana College Mathematics Competition. He is on the Editorial Board of National Association of Mathematicians’ Newsletter. He serves as a referee for Houston Journal of Mathematics, International Journal of Mathematics and Mathematical Sciences, Missouri Journal of Mathematical Sciences, College Mathematics Journal, Ars Combinatoria, and Journal of Integer Sequences. He has authored over 40 research papers, published over 70 problems, and made over 1,500 contributions to the On-line Encyclopedia of Integer Sequences. The UE Bookstore is looking for some extra help during spring rush (Jan 2-12). The person should be available during regular store hours during this time - eight hours a day. The position requires some lifting. This is a temporary position perfect for anyone looking for a little more cash. Students may be interested IF they can work all these days. Contact the UE Bookstore if interested. The GAP 310 course, Anti-Bias Education and Training will present an open session to interested attendees on campus. Prejudices such as racism, sexism, ableism, and heterosexism unfortunately still exist. This training is an activist approach to challenge those and other prejudices by raising awareness about bias and how to reduce it on campus. The students will present interactive activities that will get participants discussing and thinking about how they can see the world through a different lens. All are invited to attend. The session will be Friday, December 8th from 2:00-3:00 pm in SOBA room 272. If you have time please come and support these students. Would a class that fulfills several general education requirements and teaches you valuable life skills interest you? Do you want to reduce your course load during the regular fall or spring semesters? How would you like to take such a course NO MATTER WHERE you plan to be? If you answered yes to any of these questions, consider enrolling in COMM 380 ONLINE (Intercultural Communication) offered in Winter Intersession. For more information contact Dr. Thomlison at dt4@evansville.edu. Looking for an extra credit opportunity for a participating Psychology class? Take the survey below and follow the instructions it provides. Please note that the dean of students’ office will not grant official excused absences during finals except for extreme circumstances (i.e. : death of an immediate family member, emergency surgery, etc.). Students who feel they are unable to take a scheduled final exam should work directly with their professors to discuss other possible options. In order to process the payroll before the holiday break for the December 29th bi-weekly payroll, the Office of Accounting/Payroll is asking all staff to enter their time on WebAdvisor for the pay period December 10 to 23 by Wednesday, December 13. Supervisors are asked to approve timecards by Thursday, December 14. If you have any questions, please contact Gloria Spencer at ext.2159 for e-mail gs55@evansville.edu. Are you interested in studying abroad at Harlaxton during the Fall 2018 semester? There’s still time to apply! Priority applications for fall are due December 6, so make sure to get your applications in. To view classes that are being offered during this semester, you can visit harlaxton.ac.uk/academics/downloads/fall2018/Fall2018CourseDescriptions.pdf. 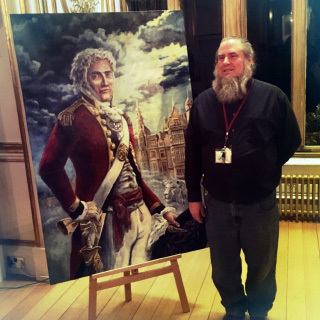 On Tuesday, November 21, a new portrait of Gregory Gregory, the man originally responsible for building Harlaxton Manor, was unveiled and donated to Harlaxton College. The work, painted by University of Evansville art professor Ralph Larmann, was created from collected images and facts into a composite portrait and was supported by a University of Evansville ARTS Grant. The resulting image was presented to the Harlaxton community in a grand unveiling ceremony. The painting is now part of the Harlaxton Manor permanent collection and will be on display outside the State Dining Room in the immediate future. Thursday, December 7 from noon-10:00 p.m.
Friday, December 8 from 2:00-5:00 p.m.
Saturday, December 9 from noon-5:00 p.m.
Sunday, December 10 from 2:00-10:00 p.m.
Monday, December 11 from noon-10:00 p.m.
Tuesday, December 12 from noon-10:00 p.m.
Wednesday, December 13 from noon-10:00 p.m.
All students are welcome to stop by and study or reserve space to study during those times. The center will provide free coffee, hot chocolate, water, and snacks for students. For more information contact lw161@evansville.edu. Textbooks for the 2017 intersession course are now available for purchase in the UE Bookstore. There are new, used, rental, and eBook options available depending on the title. Be sure to purchase your textbook before you leave for the holidays! Senior midfielder Ian McGrath and sophomore defender Simon Waever have both been named United Soccer Coaches All-West Region, it was announced in a release Monday. McGrath earned first-team all-region honors, while Waever was selected to the all-region second team. A native of New Lenox, Illinois, McGrath earns his second all-region honor of his career after a stellar senior campaign for the Purple Aces. McGrath becomes the 15th Evansville men's soccer student-athlete to earn multiple first-team all-region honors and the first since Cory Elenio completed the feat in 2006 and 2007. This season, the senior led the way for the Aces with 12 goals and six assists on the season, while capturing first-team all-MVC honors. In his career, McGrath scored 26 goals, putting him in a tie for ninth all-time at Evansville. "Ian has had a fantastic career as a Purple Ace. He has gotten better each year and improved his game during his time in our program," said Aces head coach Marshall Ray. "His numbers reflect how important of a player he was for us. He is one of the elite college soccer players competing at the Division I level. I am excited for Ian and know that he will represent our program well as he continues his soccer career." Waever receives his first all-region honor after continuing to impress in his sophomore season. In just his second year with the Aces, Waever continues to compile accolades as he earned first-team all-MVC recognition in November. The Holte, Denmark, native scored a goal and record an assist in 2017, while anchoring an Aces backline that has amassed a 1.70 goals-against average. "Simon grew in confidence this season and was a very important attacking option for us in wide areas," said Ray. "He was outstanding in the latter portions of the season on both sides of the ball and was a big part of our success as we moved into postseason play. =With Simon on the field, we always had a chance to create scoring opportunities as well as lock down the other team's attack. Simon and his class are the foundation for this team and will grow into leaders on and off the field for us this spring." For the second-straight season, the Aces finished with 10 or more wins as Evansville amassed an 11-8-2 overall record and advanced to the semifinals of the MVC Tournament. Following a pair of impressive scoring performances on the road, University of Evansville women's basketball graduate guard Hannah Noe has been named Missouri Valley Conference Newcomer of the Week, it was announced in a release by the conference office on Monday. The Dexter, Missouri, native fueled a 12-6 run with back-to-back-to-back three-pointers as she tallied 13 points on 4-9 shooting from beyond the arc in the Aces' loss at WKU. On Saturday, Noe recorded the second-best scoring outing of her career with 29 points, including six triples, in Evansville's 82-73 loss at Austin Peay. Noe currently leads the MVC in scoring and sits 71st nationally averaging 18.2 points per game, while also topping The Valley in three-pointers made per game with 3.7 per contest, the 11th-best average in the nation. The honor is the second of the season for Noe, who captured conference player and newcomer of the week recognition on November 13 for her 33-point performance in an 89-81 victory over Murray State. University of Evansville seniors majoring in psychology and neuroscience scored at the 98th percentile rank on ETS's Major Field Test in Psychology! Congratulations! Wrapping-up a three-game road trip, the University of Evansville women's basketball team travels to Lexington, Kentucky to take on 20th-ranked Kentucky at 6 p.m. (CT) on Tuesday night. Evansville is coming off an 82-73 loss on Saturday afternoon on the road at Austin Peay. The Aces led 23-20 after the first quarter before the Governors mounted an 11-0 run and took a 35-34 lead to the half. Austin Peay increased its lead as high as 17 in the early portion of the fourth quarter, but the Aces roared back to cut it to single digits late as the Governors held on for an 82-73 win. Graduate guard Hannah Noe recorded the second-most points in her career with a 29-point outing that earned her Missouri Valley Conference Newcomer of the Week honors. The Dexter, Missouri native knocked-down six triples in the loss, while playing just shy of 40 minutes in the contest. Joining Noe in double figures was senior guard Brooke Dossett who tallied 10 points, adding four rebounds and four assists. Noe has started off her Purple Aces career well, holding the MVC's best scoring average with 18.2 points per game and leading the conference in three-pointers made per game with 3.7, good enough to put her 11th nationally.